A Confederate soldier must face down 'Wild Bill' Hickok after he steals the Cavalry's horses./Two families go to war over possession of the 'Big Sag' territory in Montana. A historically inaccurate (but still entertaining) Western, I Killed Wild Bill Hickok turns the legendary folk hero into a greedy horse rustler. It has been speculated that the villain in the script was called "Wild Bill Hickok" simply to increase its bankability, as none of the events presented have any basis in historical fact. The screenplay is credited to leading man John Forbes, one of several names used by B-movie stuntman Johnny Carpenter (1914-2003). Carpenter independently produced four Westerns that he also wrote and starred in: Son of the Renegade (1953), The Lawless Rider (1954; co-produced with his good friend Edward D. Wood Jr.), Outlaw Treasure (1955) and I Killed Wild Bill Hickok. Though Carpenter's Westerns are notorious for their low production values, he was able to get dependable actors like Denver Pyle and I. Stanford Jolley to appear in them. After I Killed Wild Bill Hickok, Carpenter retired from the movie business, running the "Heaven on Earth" ranch for disabled children in Glenside, CA for almost fifty years (the ranch allowed the children to ride horses and play in a mock Western town.) I Killed Wild Bill Hickok is also one of the few feature films directed by famed silent era stuntman Richard Talmadge. By 1960, big-screen Westerns were in decline, the genre instead finding new life on the burgeoning medium of television. Legendary actor Walter Brennan and his son Andy, with their company Brennan Productions, filmed a pilot for a series they hoped would be picked up by the networks. It was to be called Barbed Wire, and would star Leif Erickson and Constance Ford. The pilot episode, "Rawhide Halo", featured the elder Brennan prominently in addition to veteran actors such as Les Tremayne, Virginia Gregg, and Don Kelly. 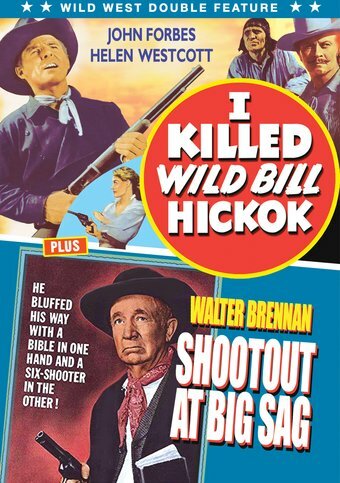 Sadly the networks passed on the series, but the pilot (with a few extra filmed scenes) was granted a theatrical release in June 1962 as Shoot Out at Big Sag. Erickson had to wait a few more years to get a series, The High Chaparral (1967-1971). Starting the same year, Walter Brennan would star in a TV Western of his own, The Guns of Will Sonnett (1967-1969).